Christmas is a busy time of year for most of us, right!? Sometimes we can’t believe it’s here again, sometimes it feels like last year was a lifetime away. Either way – if we don’t have any photographs of some of the traditions and activities we love doing with our children, they will be only a memory that could possibly fade away. So, we need photographs! Since I’m a photographer, people always ask me: do your children (ages 8, 5, and 2) get tired of the camera being out so much? They ask this because I share lots of photos of my three kids BUT let me tell you a secret – they aren’t usually looking at the camera. In the last two years I have been getting my camera out and shooting my family almost every day, and I have fallen in love with photographing honest, real, and un-staged moments. It’s a fun challenge for me to tell a story through images. Storytelling and documentary photography involves creating a series of images that tells a story using emotions, relationships, details, and moments. Nothing scripted or rehearsed. I would say 97% of the time that my camera is out, I don’t ask my kids to smile for the camera. I shoot them in their element, doing the things they love, in whatever they are wearing at the time. And I’ll tell ya – our family favorites are definitely the everyday photos, not the ones during the 3% where I make crazy sounds and have everyone look at me in hope for smiles. What I love the most is seeing their personalities shine through in the unscripted moments. They are truly priceless. So maybe I have you sold on trying out a storytelling session, right? Maybe? Say yes. You won’t regret it! 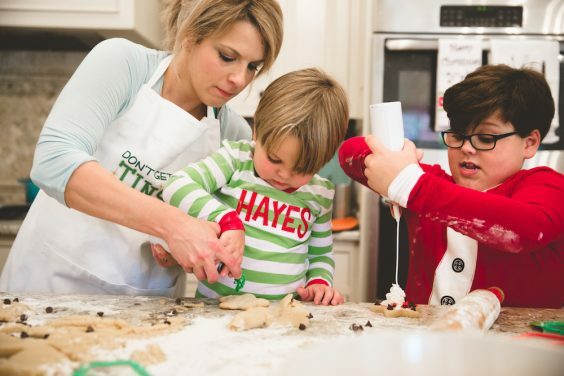 As parents, we carry on familiar holiday traditions and create new ones. We teach our children the reason for the season. We put up the tree, we read stories by the tree, we bake cookies, we decorate the house, we open gifts, we light candles, we have and do so many meaningful activities, and we hope our children will remember them all as they grow older. Here’s how we can help our children remember and how we can preserve this special time with our favorite people through a meaningful (and fun!) non-traditional photo session. First, look for a photographer that offers sessions in-home or on-location (meaning not in a studio). Then think about the types of photos you want to tell your story. Do you want real, honest moments just you and your family being yourselves? Do you want somewhat scripted, or posed, or the photographer to tell you what to do? If you choose a photographer that offers family documentary photography or storytelling photography, your photos will be of unscripted moments that happen naturally during your time together. These types of photographers will focus on creating a series of images of real, honest moments to tell your story. They will photograph you and your family doing what you do and not intervene. If you want more scripted or posed moments where the photographer directs you, a lifestyle photographer might be what you need. Just be sure to communicate to your photographer what it is you want from your time together and make sure you are both on the same page prior to the session. Sidenote: be sure your photographer either offers digital files or an album. You will want these photos displayed and treasured in an album to be looked at for years to come. What activities do you and your family do together around the holidays? What traditions do you have from your childhood that you want to pass on to your children? What new traditions have you started? What activities are fun for the whole family? Your location should be meaningful and appropriate for the activity. Many times this will be at your home when it comes to holiday traditions being photographed. But if you are going to pick out your Christmas tree, be sure your photographer comes along! Clothing should be appropriate for the activity. Wearing pajamas during stories at bedtime is perfect! Don’t deck yourselves out in formal or fancy outfits if you are going to be doing a casual activity like baking cookies or decorating the tree. Being yourselves will give your children and their children meaningful photos and a true glimpse into how life is right now. All family members should be present. This is so important. Have everyone there from the newborn baby all the way up to the teenagers in your house. And if grandparents are nearby and they can be involved, I say the more the merrier in these types of sessions. You will be glad later. Not only should this be a time to capture this special time, but it should be a fun memory too. Don’t worry about the photographer moving around the room, just loosen up and have fun. Smile, laugh, and be yourselves. Everyone’s personality will shine through if you just have fun, laugh genuinely, and relax. Katie Tillman is a professional photographer in Natchez, Mississippi with a passion for storytelling sessions, where she finds the beauty in the everyday. Unscripted, unposed, just you being you. Candid, honest, humorous, quiet, and everything in between.